Some things are so complex, they need simplicity to explain. Truth is, many things are basically not so complex, as long as you have the ability to leave out the details and drill down to the essence. A great example is the website How Stuff Works. Want to know what a black hole is? No problem. For a while we have been working on our concept ‘simpL‘. Inspired by the series ‘in Plain English’ we started our own endeavour and created the first series for one of our customers. Today we are proud to release our latest product in this series, used in a campaign to introduce a platform for veterinarians to improve communication with their customers. 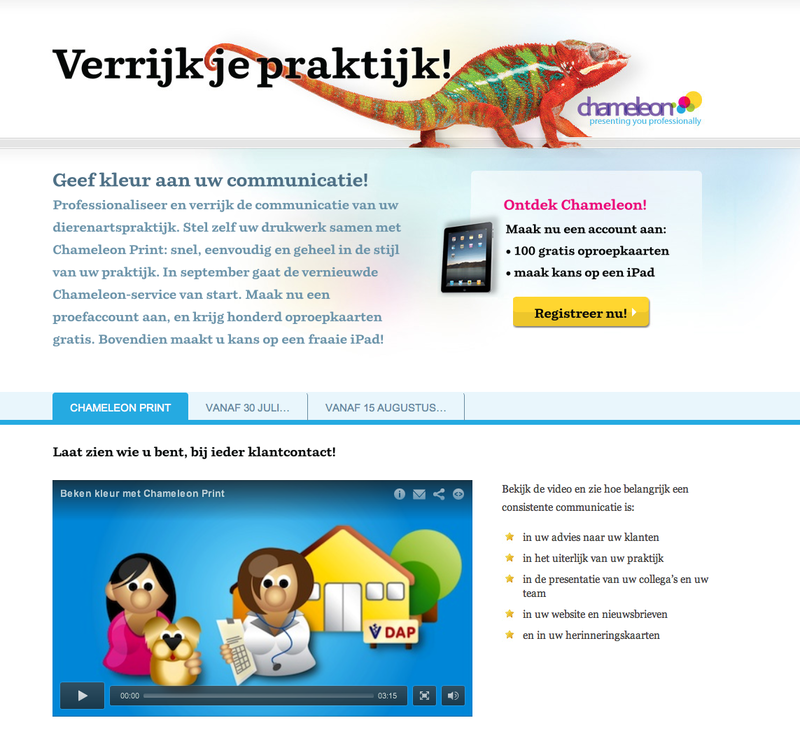 This platform is called ‘Chameleon’ and forms the basis for communication improvement for veterinarians. We used our ‘simpL’ series to explain the essence of the service. The videos were part of a larger digital ecosystem and an offline promotional campaign which we -together with a great team- helped building as well. 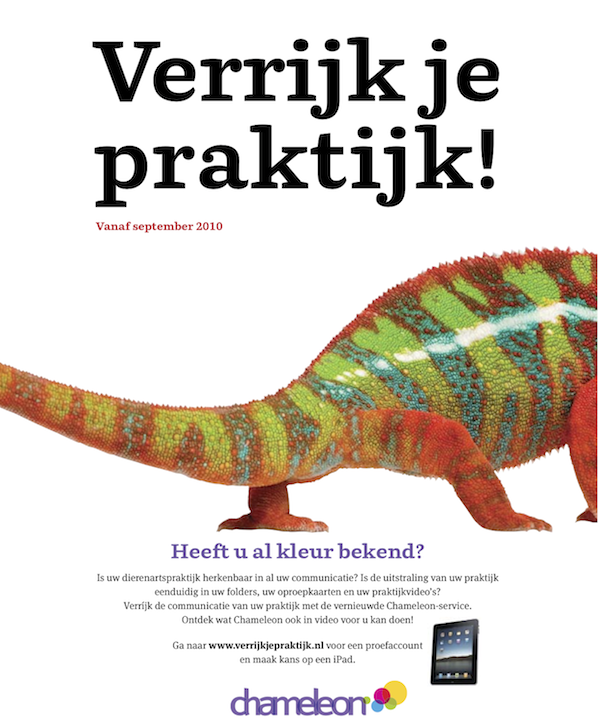 An interesting cross-media campaign with the title ‘Enrich Your Practice’, hinting to the way veterinarians can improve their practice, get loyal customers and gain a competitive advantage by paying more attention to communication. The assignment was to create three ‘teasing’ videos which would explain the need for the veterinarian (in this case: professional communication) and the solution provided to meet that need. In the first series we focussed on the online service to create reminder cards, the second series dealt with online video. We created the artwork in Illustrator, the animations took place in Apple’s Motion and the final cut was done in ..eehh.. Final Cut. The offline campaign consisted of three ads in various veterinary-related magazines. These ads pointed to the website where visitors were drawn to the videos to learn more about the platform. The Call to Action on the website is to get people to subscribe to the service. The Call to Action is enhanced by giving away 100 reminder cards and the chance to win an iPad. Each video ends with a cliffhanger to motivate people to return. The official platform will launch in September, for which we will use some innovative techniques to deliver the message. Unfortunately I can’t say anything about visitors, retention, views etcetera, since all this information is confidential. I can, however, show you the videos. Video’s we are pretty proud of. What do you think? Will our simpL videos communicate the message better? What’s your overall view on the campaign? Since a few months I see a distinct increase in web exposure of the so-called ‘tablet concept’: a thin, 9 inch in diameter computerlike device without keyboard, intended to be used as a replacement of reading books and magazines, and allegedly competing against the ever popular Netbooks. There is an increasing number of eBooks or eReaders introduced in the market and the buzz about Apple developing such device is heating up day by day. But what is this ‘tablet’, and how does it compare to the current portfolio of eReaders such as the Kindle? Flat, no buttons. Have you ever seen a magazine with buttons? Always connected. People want to subscribe to newspapers and get the latest news instantly. If there is a party that can pull this off it might be Apple. Sources say that the device was finished but got stuck on negotiations with the service provider for the wireless connection. Rumour has it that Apple will introduce the device somewhere in the first half of next year. What would be the business benefit for such a device? Will this be a step closer to a paperless office. I guess that all depends on the functionality and price of such a device. After all, in a business environment the tablet will compete more or less with a laptop or desktop computer (since most people are staring at their screen 6 hours a day anyway). For mobile workers or sales representatives however, this may be a dream come true. Imagine going to a customer and show your newest product in the tablet. No printed cheesy brochures, always up to date and immersed in rich media. And what about conferences? In pharma many conferences are organized for the Health Care Professional. It is known that Big Pharma spends big on these conferences, so why not invest in a tablet to include when participating at the congress? Put all clinical data on it, conference program, information about the venue, etcetera. And since they have the device anyway, why not let them subscribe to your valuable Clinical Data Channel, so that the newest data is pushed to the HCP automatically? So many possibilities. Or am I too much in overdrive here…? Don’t think so. Have a look at the following video and just amaze yourself where the future is going. We all know Social Marketing is the Next Big Thing. Or at least, that’s what we are all saying to each other. Making each other believe that the era of the 4/5/6 P’s is finally over. And of course Big Pharma can not stay behind forever. In a relatively short period the content of pharma congresses has changed dramatically. Two years ago a typical pharma marketing congress dealt with eDetailing, brand management and CRM systems. Now it’s about communities, Twitter, authenticity and transparency. Finally. It was the first attempt for EXL Pharma to enter the ‘Old World’ with their Digital Pharma congress. Already an established event in the States, they now found the time right to see whether the Europeans are like-minded in the exciting area of new/social/digital media in pharma. And it seems that they are not the only one, by the way. This year alone we have been contacted by two other congress organizations which are planning to enter this space as well. It’s an interesting area to be in right now, especially when you have a story to tell. We just returned from Barcelona (raining for two days, bummer!) and we look back to -in our view- a succesful first event organized by EXL. Of course not all things were perfect, it usually isn’t – especially when you do it for the first time. But I have to admit that Jason Youner and Bryan Main did a good job in pulling this thing off. Kudos go to them. EXL’s Digital Pharma Europe was organized in Barcelona on March 30 and 31. See for the full program here. The morning of the first day was reserved for a workshop entitled ‘Successfully integrating Digital Media into the Overall Marketing Mix’. Sam Trujillo, Director of Marketing Women’s Health explained in a three hour session the view of Bayer Schering on the way to engage with digital media in the marketing mix. Apart from the fact that a workshop usually involves ‘working’ and we didn’t do more than just listening, I did not find his story appealing and at it’s place at this event. His story was mainly focussing on digital media (fair enough) but it looked like the process he was presenting very much described the traditional approach of pharma companies using media: to stay in control. Seriously, I just do not think that putting your commercials on YouTube will generate a lot of traffic towards your channels. Who on earth is going to watch voluntarely a commercial of a pharma company, including the usual fair balance BS? It’s just not the channel for that. The rest of the day was reserved for more Social Media stuff. So did Jeff Hithcock from ‘Children With Diabetes‘ (CWD) a touching presentation on his social network for parents and children with diabetes. Once started as a virtual space he created for his daughter suffering from diabetes, now a huge online community for thousands of diabetes children. Recently J&J acquired CWD. It’s not clear to me however what’s in it for J&J. Another great presentation was from Heidi Youngkin, Executive Director Global Marketing at J&J. She held an informative and engaging talk on her ‘Social Media Adventures’ within J&J. Intruiging to see that a pharma company is already that advanced. No doubt the fact that J&J is a huge company with a lot of FMCG might help, but still. I’m sure that her guidelines will be used as a ‘golden standard’ and reference frame within more pharma companies (I saw a lot of people making notes, since her presentation was not available online). Interestingly J&J started slowly with a blog about the history of the company (nice and safe). After they gained sufficient experience with this new medium they introduced a blog more specifically targeted towards their end users and dealing with more complex subjects. Now they have entered the third stage, going beyond blogs such as participating in the beforementioned community CWD. During the rest of the conference J&J was quoted and cited as ‘Best Practices’ on several occassions. The first day finished by a lively panel discussion moderated by Len Starnes, Head of Digital Marketing & Sales General Medicine at Bayer Schering. The panel discussion covered the paradigm shift of web 2.0 in the pharma world. Or should we say how pharma lives in the past not using (some of) these technologies. Interestingly it turned out that the FDA was present as well. Silently sitting in the back of the room, observing how Big Pharma is struggling with this paradigm shift. It sure is a pitty they (or anybody else for that matter) didn’t take the opportunity to start the conversation. And where were the European authorities? Len must have done a great deal with EXL 😉 because the next day he kicked-off the second day of the event with his presentation entitled ‘Healthcare Professionals’ Social Networks – The Beginning of the End of Pharma Marketing As We Know It’. We’ve met Len at several other congresses and it’s always good to listen to his vision on digital marketing within Big Pharma. This time he gave a sound overview of all possible social networks available for the HCP (Health Care Professional). Although a few big players (Sermo and MedScape) there is still room for niche players like Ozmosis for example. And what about Europe? Well, it seems that Doctors.net.uk and DocCheck Faces are the biggest players on our continent but they will soon face competition by the Powerhouse Sermo which intends to introduce here in the not so distant future. Main question of course is how Big Pharma can participate in these communities. Sermo has a partnership with Pfizer, so is this the way to go? Len was firm in his statement that the pharma industry should observe, research, engage and discuss, but under no circumstances should hard sell. He also did a small poll on LinkedIn which showed that 86% of his network believes that Social Networks will have an impact on pharma marketing within the near future. My presentation was next, talking about the internal use of Social Media in the light of innovation in marketing services. I am always surprised to see that an entire industry just jumps on the bandwagon of using social media for external use and just forgets that they first have to deal with yet another -equally important- community: their employees. Why is it that I can’t find more about my colleagues in Outlook’s address book other than their name, telephone number and office number whereas when I check on Facebook and LinkedIn I can find half of their life? Why is it that even a New Media Specialist is blocked access to YouTube at the office because she ‘might watch YouTube videos all day long’? Get seriouss, executives. Wake up in a new world and embrace yourself for the entrance of the digital natives, people who are actually used to share information with each other (and are hence not afraid to lose their ‘power’ when they do). Or read this for a change. We want to create a common platform within our organization where employees can find our internal blog, wikis, podcasts and share ideas. And if that means that we have to pull-in some people screamin’ and kickin’, so it is. Change is never without some pain. Yet another great presentation was from Kevin Nalty, Marketing Director Dermatology at a large pharma company which name could not be revealed but starts with an ‘M’ and ends with ‘erck’. Besides his serious job he moonlights as an official YouTube Comedian. His website Willvideoforfood is described as ‘a blog for online video, advertising, viral marketing, consumer generated media and blatant self-promotion’. Don’t know if he really needs a site doing all this since he’s one of the top-10 most viewed YouTube comedians with more than 750 videos seen in excess of 60 million times. He even wrote an e-book ‘How To Become Popular On YouTube Without Any Talent’. Well, I don’t have to explain you that we 100% agree with his vision about the power of video in communication. What we do differ in opinion is that although content is still king, form is becoming more and more important. By that I mean that the basic elements of filming should be carried out well (e.g. sound, lightning, basic rules of camera movement). That doesn’t mean that I think one should make a slick commercial. Please don’t. Some ‘rough edges’ gives it most of the time a bit more genuine look. But I will skip videos where the sound quality is poor, even if they have a nice story to tell. Now, online video is exploding: Pharma, wake up and start using it! The last presentation was an overview of the possibilities Google has to offer big Pharma. Interesting in that respect is Google.org, a CSR initiative of Google helping the community with their innovative concepts. I think it was a good start for such an event. I hope that for next congresses dealing with this subjects participation of European authorities is paramount since they are the gatekeepers of communication possibilities within our industry. Compared to the US Europe is different in that respect, also because we (still) have many different local authorities which can play and are playing according to their rules. The market is changing, people are getting more informed. The question is which information they use in order to get informed, and to what respect the quality of information is improved if Pharma can participate in the discussion. Pharma on the other hand should take it’s responsibility too, by being open and transparent about their products and claims. Pharma is low on the trust-scale, time to open up and fix that. Looking to the people in the audience I have the feeling that Pharma is ready for it. Now authorities, give them the opportunity to do so. Stay tuned, soon I will post my presentation including the video online. See the clip first before reading further. Imagine that you want to start a service, a service that already exists. Let’s say, slideshows. There are tonnes of programs available on the PC or Mac, and an equivalent number online. So how are you going to compete? How are you going to diversify? And more importantly, what will be the business model? That’s what the guys and girsl at Animoto were up against. They did have one thing in their advantage; they were all coming from the film industry so the knew a thing or two about how to present images. Animoto says in their tagline: ‘The End of Slideshows’. And it’s true. Although I can make nice slideshows in iPhote, some people may even be able to make nice slideshows on a PC (just don’t mention teh word PP, please…) but they all kinda look dull. OK, Ken Burns effect is sort of cool and it makes your slideshow more vivid but it wears off once you have seen it too much. Also, making a slideshow, eerrr, nice slideshow can be painstakingly cumbersome. Import a picture, set in and out points, edit the movement… It takes a few hours before you master it and have some result. If you want to make it really cool (like the one you just saw) just add a few hours more to the equation. So, take an existing service and improve it considerably, How does Animoto tackle this? First, ease of use. I don’t know if you believe me, but making this slideshow took me about 10 minutes (including making coffee): uploading pictures, adding some text, choose a song, push a button, drink coffee. Animoto analyzes your images and your music (although they say they do that…) and based on the outcome they create a slideshow. Which brings me to the second point: they make a really, really cool slideshow. Well, in my opinion they did a pretty good job. So what’s the business model? Very web 2.0-ish. You can create for free (yeah, free = good = web 2.0!) a 30 seconds clip. Just upload some pictures (or get them from your Flickr account) choose a song in their library (or upload your own) and push a button. In no time you have your 30 seconds photo-videoclip. But that’s just to wet your appetite. Of course, 30 seconds is way too short and before you know it you see yourself buying credits to make a full-length videoclip, including the option to download the file. Costs? $3 per video or $30 for an annual subscription so you get unlimited slideshows. Expensive? Not in my view. And then the ease of use comes back. With a few clicks (and a PayPal account) you have bought your credits and off you go. So taking an existing service with lots of available options on the marketplace, think it through carefully and pimp it up like hell. That’s how Animoto did, and that’s how you should be looking at services too. It sure is a privilege to have had the opportunity to talk to these people.